When America’s First Super Soldier charges into battle, his iconic shield is his first line of defense. 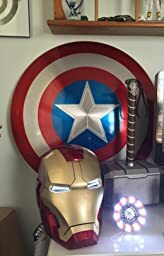 Specifically modeled on the First Avenger’s trademark symbol, the Marvel Legends Captain America 75th Anniversary metal shield is constructed of metal and measures an impressive 24 inches in diameter. It also features two adjustable straps, allowing it to be worn like Captain America, in true premium role play fashion. Immediately recognizable, with exceptional detailing and premium finish, the Marvel Legends Captain America 75th Anniversary metal shield commemorates the First Avenger with signature Marvel Legends precision and style. Copyright 2015 Marvel. Hasbro and all related terms are trademarks of Hasbro. I gotta say I’m quite amazed at this product. The metal sounds amazing when you strike your hand on it but I don’t recommend you use full force of course. The finish quality on the shield is quite amazing and there was no faulty marks or anything on my shield. One thing that I was quite surprised about was the weight of this shield. When you first get the box, you know what you’re expecting but it doesn’t feel heavy. However, once you wear the shield on your forearm, which comes nicely in fake leather straps, sturdy and tough straps, you get a sense of the weight start the bare down on your arm. The weight added onto your arm, you can do some serious damage even if the shield is made from Aluminum. The straps are adjustable and like said before, its a sort of fake leather material but still feels nice to the touch. This is certainly going to go well with my Captain America cosplay or if you love running around the house and bothering your girlfriend with this shield…better yet…this is a perfect shield for you for when you guys fight and she starts throwing things at you. All around, a great solid purchase! Very well made shield and is the cheapest movie accurate metal shield out there. However the paint job could of been better. I take 1 star off because there is a hair stuck in the paint on the front of the shield. Disappointing but can only be seen when you really look for it. Otherwise the shield looks great for display purposes.